You don't have to be of Celtic or Irish descent to appreciate the beauty of Celtic engagement rings. Your engagement represents an important moment in your life, so you and your partner should choose any style of engagement rings that you want. If you like the way Celtic engagement rings look, then it's perfectly ok to choose that style. There aren't many non-Celtic couples choosing to wear Celtic engagement rings, so you’ll certainly set yourself apart from the crowd. Celtic jewelry is noticeable because of its exquisite and complicated patterns. All Celtic engagement rings have intricate designs worked into the band. Patterns that look like interlocking chains or braids are very common. These patterns are often raised, and give the impression of heavy duty metal work. Celtic engagement rings are nothing like what most traditional wedding rings look like. So if you want to be a little different, Celtic jewelry can help you do it. It's not common to see people wearing Celtic jewelry, but Celtic engagement rings are growing in popularity. The jewelry contains elements of Celtic history, but is often more beautiful than modern pieces. Anyone who appreciates fine jewelry will understand the value of any piece patterned with intricate Celtic designs. Celtic engagement rings are more than just rings. They are culturally influenced, and have strong cultural meanings. For example, a certain pattern may represent hope, while another pattern may represent harmony. If you're going to exchange Celtic engagement rings, then it's a great idea to learn the meanings behind the designs. Some designs even symbolize life, a perfect union and an everlasting commitment. It’s important to understand the underlying symbolism of the rings you plan to purchase. When choosing Celtic engagement rings, you need to remember the cultural significance. It's not necessary to be Celtic or Irish to appreciate the jewelry, but you should still respect the culture from which the jewelry comes. 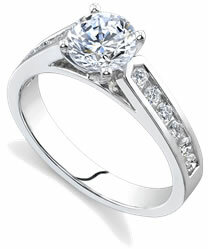 Very few engagement rings come with tradition and history already built into the design. If someone asks you what the design on your Celtic rings symbolizes, you should be able to tell them. Celtic engagement rings represent the rich, diversified and proud tradition of the Celtic civilization. The jewelry successfully blends traditional Celtic patterns and contemporary craftsmanship. The designs of Celtic engagement rings range from intricate spiral designs of the ancient Celts to the elaborate knot-work decoration of medieval Irish Christians. Claddagh rings are probably the most well known and popular examples of Celtic jewelry. Claddagh rings are traditional Irish rings that symbolize love, loyalty, and friendship. These rings are known for their intricate design and symbolism. These rings aren't generally classified as Celtic engagement rings, but the symbolism does relate to marriage. You can tell what a Claddagh ring represents just by looking at it. The design consists of: two hands clasped together, a royal crown, and a heart. The heart represents love, the crown represents loyalty, and the hands represent friendship. As you can see, Celtic engagement rings (and Celtic jewelry in general) are full of meaning.